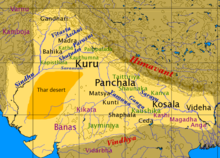 The Kambojas were a tribe of Iron Age India, frequently mentioned in Sanskrit and Pali literature. The tribe coalesced to become one of the solasa (sixteen) Mahajanapadas (great kingdoms) of ancient India mentioned in the Anguttara Nikaya. 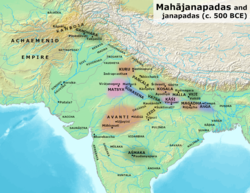 Kambojas and other Mahajanapadas in the Post Vedic period. The ancient Kambojas were probably of Indo-Iranian origin. They are, however, sometimes described as Indo-Aryans[page needed][volume needed] and sometimes as having both Indian and Iranian affinities. The Kambojas are also described as a royal clan of the Sakas. The earliest reference to the Kambojas is in the works of Pāṇini, around the 5th century BCE. Other pre-Common Era references appear in the Manusmriti (2nd century) and parts of the Mahabharata, both of which described the Kambojas as former kshatriyas (Warriors caste) who had degraded through a failure to abide by Hindu sacred rituals. Their territories were located beyond Gandhara, beyond Pakistan, Afghanistan laying in Tajikistan, Uzbekistan, Kyrgyzstan where Buddha statues were built in the name of king Maurya & Ashoka and the 3rd century BCE Edicts of Ashoka refers to the area under Kamboja control as being independent of the Mauryan empire in which it was situated. The confederation of the Kambojas may have stretched from the valley of Rajauri in the south-western part of Kashmir to the Hindu Kush Range; in the south–west the borders extended probably as far as the regions of Kabul, Ghazni and Kandahar, with the nucleus in the area north-east of the present day Kabul, between the Hindu Kush Range and the Kunar river, including Kapisa possibly extending from the Kabul valleys to Kandahar. Others locate the Kambojas and the Parama-Kambojas in the areas spanning Balkh, Badakshan, the Pamirs and Kafiristan. D. C. Sircar supposed them to have lived "in various settlements in the wide area lying between Punjab, Iran, to the south of Balkh." and the Parama-Kamboja even farther north, in the Trans-Pamirian territories comprising the Zeravshan valley, towards the Farghana region, in the Scythia of the classical writers. [page needed] The mountainous region between the Oxus and Jaxartes is also suggested as the location of the ancient Kambojas. The name Kamboja may derive from (Kam + bhoj "Kamma+boja"), referring to the people of a country known as "Kum" or "Kam". The mountainous highlands where the Jaxartes and its confluents arise are called the highlands of the Komedes by Ptolemy. Ammianus Marcellinus also names these mountains as Komedas. The Kiu-mi-to in the writings of Xuanzang have also been identified with the Komudha-dvipa of the Puranic literature and the Iranian Kambojas. The two Kamboja settlements on either side of the Hindu Kush are also substantiated from Ptolemy's Geography, which refers to the Tambyzoi located north of the Hindu Kush on the river Oxus in Bactria, and the Ambautai people on the southern side of Hindukush in the Paropamisadae. Scholars have identified both the Ptolemian Tambyzoi and Ambautai with Sanskrit Kamboja. Scholars, such as Ernst Herzfeld, have suggested etymological links between some Indo-Aryan ethnonyms and some geonyms used by Iranian-speaking peoples of the Caucasus Mountains and Caspian basin. In particular, Kamboja somewhat resembles the hydronym Kambujiya – the Iranian name for the Iori/Gabirri river (modern Georgia/Azerbaijan). Kambujiya is also the root of Cambysene (an archaic name for the Kakheti/Balakan regions of Georgia and Azerbaijan) and the Persian personal name Cambyses. (A similar link is suggested between the Kura River, which is near the Iori, and the name of the Kurus and Kaurava mentioned in vedic literature.) Such etymologies have not, however, been universally accepted. The capital of Kamboja was probably Rajapura (modern Rajauri). The Kamboja Mahajanapada of Buddhist traditions refers to this branch. Kautiliya's Arthashastra and Ashoka's Edict No. XIII attest that the Kambojas followed a republican constitution. Pāṇini's Sutras tend to convey that the Kamboja of Pāṇini was a "Kshatriya monarchy", but "the special rule and the exceptional form of derivative" he gives to denote the ruler of the Kambojas implies that the king of Kamboja was a titular head (king consul) only. One king of Kamboja was King Srindra Varmana Kamboj. The Kambojas were famous in ancient times for their excellent breed of horses and as remarkable horsemen located in the Uttarapatha or north-west. They were constituted into military sanghas and corporations to manage their political and military affairs. The Kamboja cavalry offered their military services to other nations as well. There are numerous references to Kamboja having been requisitioned as cavalry troopers in ancient wars by outside nations. It was on account of their supreme position in horse (Ashva) culture that the ancient Kambojas were also popularly known as Ashvakas, i.e. horsemen. Their clans in the Kunar and Swat valleys have been referred to as Assakenoi and Aspasioi in classical writings, and Ashvakayanas and Ashvayanas in Pāṇini's Ashtadhyayi. The Kambojas were famous for their horses and as cavalry-men (aśva-yuddha-Kuśalah), Aśvakas, 'horsemen', was the term popularly applied to them... The Aśvakas inhabited Eastern Afghanistan, and were included within the more general term Kambojas. Elsewhere Kamboja is regularly mentioned as "the country of horses" (Asvanam ayatanam), and it was perhaps this well-established reputation that won for the horsebreeders of Bajaur and Swat the designation Aspasioi (from the Old Pali aspa) and assakenoi (from the Sanskrit asva "horse"). The Kambojas entered into conflict with Alexander the Great as he invaded Central Asia. The Macedonian conqueror made short shrift of the arrangements of Darius and after over-running the Achaemenid Empire he dashed into today's eastern Afghanistan and western Pakistan. There he encountered resistance from the Kamboja Aspasioi and Assakenoi tribes. The Ashvayans (Aspasioi) were also good cattle breeders and agriculturists. This is clear from the large number of bullocks that Alexander captured from them – 230,000 according to Arrian – some of which were of a size and shape superior to what the Macedonians had known, and which Alexander decided to send to Macedonia for agriculture. During the 2nd and 1st centuries BCE, clans of the Kambojas from Central Asia in alliance with the Sakas, Pahlavas and the Yavanas entered present Afghanistan and India, spread into Sindhu, Saurashtra, Malwa, Rajasthan, Punjab and Surasena, and set up independent principalities in western and south-western India. Later, a branch of the same people took Gauda and Varendra territories from the Palas and established the Kamboja-Pala Dynasty of Bengal in Eastern India. The Kambojas of ancient India are known to have been living in north-west, but in this period (9th century AD), they are known to have been living in the north-east India also, and very probably, it was meant Tibet. The last Kambojas ruler of the Kamboja-Pala Dynasty Dharmapala was defeated by the south Indian Emperor Rajendra Chola I of the Chola dynasty in the 11th century. The Kambojas find prominent mention as a unit in the 3rd-century BCE Edicts of Ashoka. Rock Edict XIII tells us that the Kambojas had enjoyed autonomy under the Mauryas. [page needed] The republics mentioned in Rock Edict V are the Yonas, Kambojas, Gandharas, Nabhakas and the Nabhapamkitas. They are designated as araja. vishaya in Rock Edict XIII, which means that they were kingless, i.e. republican polities. In other words, the Kambojas formed a self-governing political unit under the Maurya emperors. Ashoka sent missionaries to the Kambojas to convert them to Buddhism, and recorded this fact in his Rock Edict V.
^ Dwivedi 1977: 287 "The Kambojas were probably the descendants of the Indo-Iranians popularly known later on as the Sassanians and Parthians who occupied parts of north-western India in the first and second centuries of the Christian era." ^ a b c "Political History of Ancient India", H. C. Raychaudhuri, B. N. Mukerjee, University of Calcutta, 1996. ^ See: Vedic Index of names & subjects by Arthur Anthony Macdonnel, Arthur. B Keath, I.84, p 138. ^ Purana, Vol VI, No 1, January 1964, p 207 sqq; Inscriptions of Asoka: Translation and Glossary, 1990, p 86, Beni Madhab Barua, Binayendra Nath Chaudhury - Inscriptions, Prakrit). ^ The Peoples of Pakistan: An Ethnic History, 1971, pp 64-67, Yuri Vladimirovich Gankovski - Ethnology. ^ History of the Pathans, 2002, p 11, Haroon Rashid - Pushtuns. ^ Michael Witzel Persica-9, p 92, fn 81. ^ Asoka and His Inscriptions, 1968, pp 93-96, Beni Madhab Barua, Ishwar Nath Topa. ^ Sircar, D. C. (1971). Studies in the Geography of Ancient and Medieval India. p. 100. ^ Central Asiatic Provinces of the Mauryan Empire, p 403, H. C. Seth; See also: Indian Historical Quarterly, Vol. XIII, 1937, No 3, p. 400; Journal of the Asiatic Society, 1940, p 37, (India) Asiatic Society (Calcutta, Royal Asiatic Society of Bengal - Asia; cf: History and Archaeology of India's Contacts with Other Countries, from Earliest Times to 300 B.C., 176, p 152, Shashi P. Asthana; Mahabharata Myth and Reality, 1976, p 232, Swarajya Prakash Gupta, K. S. Ramachandran. Cf also: India and Central Asia, p 25 etc, P. C. Bagchi. ^ History and Archaeology of India's Contacts with Other Countries, from Earliest Times to 300 B.C., 1976, p 152, Shashi Asthana; Mahabharata Myth and Reality, 1976, p 232, Swarajya Prakash Gupta, K. S. Ramachandran. ^ "The Town of Darwaz in Badakshan is still called Khum (Kum) or Kala-i-Khum. It stands for the valley of Basht. The name Khum or Kum conceals the relics of ancient Kamboja" (Journal of the Asiatic Society, 1956, p 256, Buddha Prakash [Asiatic Society (Calcutta, India), Asiatic Society of Bengal]). ^ Journal of the Asiatic Society, 1956, p 256, Asiatic Society (Calcutta, India), Asiatic Society of Bengal. ^ See: Problems of Ancient India, 2000, p 5-6; cf: Geographical Data in the Early Puranas, p 168. ^ Hindu Polity: A Constitutional History of India in Hindu Times, Parts I and II., 1955, p 52, Dr Kashi Prasad Jayaswal - Constitutional history; Prācīna Kamboja, jana aura janapada =: Ancient Kamboja, people and country, 1981, Dr Jiyālāla Kāmboja - Kamboja (Pakistan). ^ Studies in Skanda Purana, 1978, p 59, A. B. L. Awasthi. ^ a b Hindu Polity, 1978, pp 121, 140, K. P. Jayswal. ^ War in Ancient India, 1944, p 178, V. R. Ramachandra Dikshitar - Military art and science. ^ Proceedings, 1965, p 39, by Punjabi University. Dept. of Punjab Historical Studies - History. ^ Geographical Data in the Early Purāṇas: A Critical Study, 1972, p 168, M. R. Singh - India. ^ History of Ceylon, 1959, p 91, Ceylon University, University of Ceylon, Peradeniya, Hem Chandra Ray, K. M. De Silva. ^ See: Corpus Inscriptionum Indicarum, Vol II, Part I, p xxxvi; see also p 36, Sten Konow; Indian Culture, 1934, p 193, Indian Research Institute; Cf: Journal of the Royal Asiatic Society of Great Britain and Ireland, 1990, p 142, Royal Asiatic Society of Great Britain and Ireland - Middle East. ^ H. C. Raychaudhury, B. N. Mukerjee; Asoka and His Inscriptions, 3d Ed, 1968, p 149, Beni Madhab Barua, Ishwar Nath Topa. ^ Bimbisāra to Aśoka: With an Appendix on the Later Mauryas, 1977, p 123, Sudhakar Chattopadhyaya.